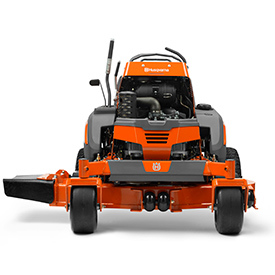 Designed for commercial-grade lawn care, the Husqvarna V500 series combines extreme efficiency and durability with a compact design for excellent maneuverability. Both the V548 and V554 models have zero-turn capability and the ergonomic body cushion will provide maximum operator comfort. With a rapid mount-dismount, unbeatable maneuvering and ergonomic operation, operators get the best of zero-turn and commercial walk-behind combined. Backed by Husqvarna’s industry-leading 5-year limited commercial warranty, the V500’s heavy-duty construction combined with industrial strength drive systems deliver long-lasting operation. Other features include tool-less tracking adjustment and removable deck covers, easy-to-reach transmission by-pass and front-mounted hydro tanks and pumps for fast, convenient access and service. Available with a 48-in. or 54-in. Commercial ClearCut deck, the V500 models provide excellent grass cutting and management. For more information, please visit www.husqvarna.com.